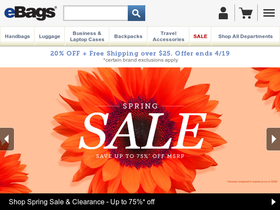 eBags, online at eBags.com, is one of the largest online bag retailers out there. eBags is the only place you need to visit to find your next handbag, luggage, laptop bag, messenger bag, or backpack. eBags offers amazing deals on top brands like The North Face, Michael KORS, adidas, Fossil, and more. eBags also carries travel accessories, wallets, totes, duffel bags, snow and skate bags, and bags for kids. Visit RetailSteal.com to save even more on bags with eBags coupons, eBags promo codes, and eBags discounts. Free shipping offers are often available with a minimum purchase. eBags ships to the 50 US states and Canada. Allow 3-7 business days for standard delivery. eBags guarantees your satisfaction for 60 days from receipt of your order. See website for full details, exclusions may apply. Get 25% off your purchase of Burton bags with this coupon code on eBags.com. Click to save. Take 20% off any order plus get free shipping when spending over $100 while using the coupon code at eBags.com. Click to save. Spend $25 or more at eBags.com and get free shipping on your order. Click link now to save. Shop clearance items at eBags.com to save up to 70%. Click link now. Visit eBags to save up to 60% on women's laptops bags. Click link to save. Save 50% on select laptop bags when shopping online at eBags.com. Click to save. At eBags, save up to 50% on Samsonite bags when you shop online. Click link to purchase. Support Breast Cancer Research with Pink Ribbon products at eBags.com. 10% of your purchase supports the cause. Click link now. Buy a product by The North Face and get free shipping when spending over $50 at eBags.com. Click to save. Hurry over to Modaqueen.com and save 8% discount and receive free shipping with this coupon code. Shop ModaQueen.com and save $25 off your total purchase of $500 or more with promo code. Get up to 73% off on Fendi Handbags when you shop at Moda Queen. Click link to shop online. At Moda Queen, save up to 75% on Prada and Tod's Handbags plus get free shipping. Click link to buy. At Moda Queen, save up to 70% on designer sunglasses and get free shipping. Click link for savings.